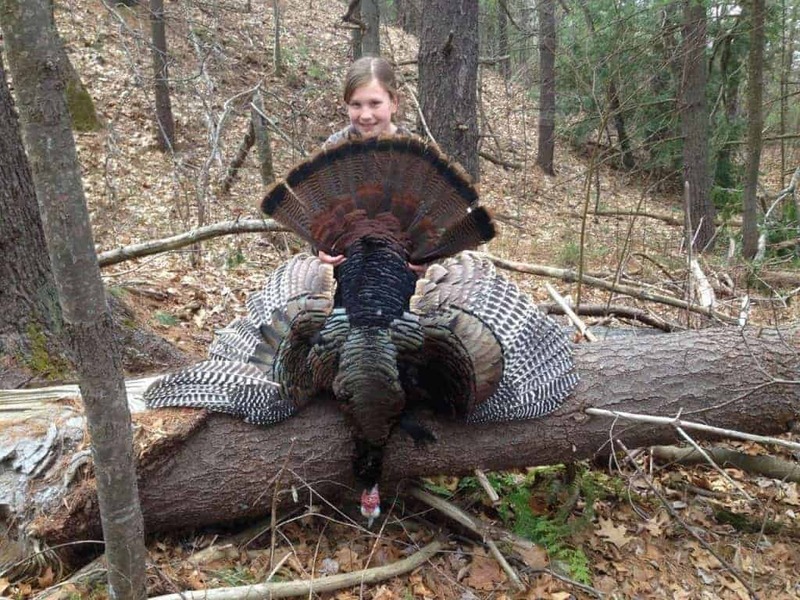 VT Spring Turkey: Hunt 2 - Barbed Hooks and a Dumb Bird - the4pointer.com | Real Hunts. Unreal Stories. The story of my second turkey hunt begins right where you would expect – at the beginning. All week I’d looked forward to redeeming myself after my opening day disaster. 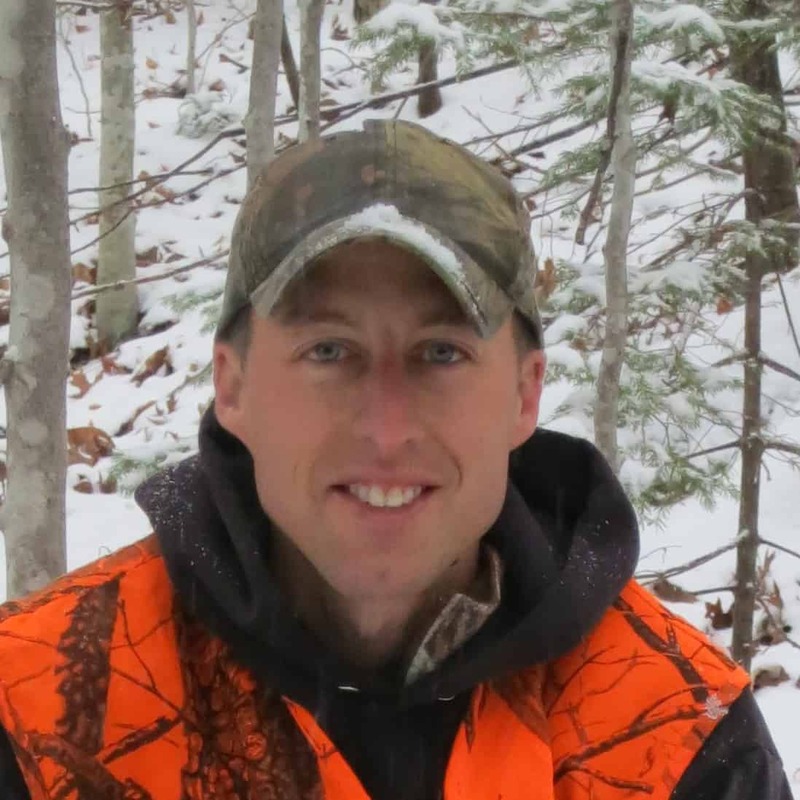 The only problem was that I’d be hunting alone for the first time, and I still lacked some essential equipment (and skills) to maximize my chances at harvesting a turkey. 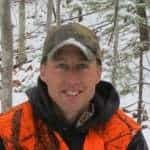 I knew I needed some more gear, and my research had led me to believe that a locator call, such as an owl hoot or crow call, was pivotal to locating birds in the morning. Fortunately for me, my wife offered to stop by Runnings in Claremont, New Hampshire on Friday to see if there were any calls left. She found one, a crow call, and also picked up a facemask to cover my ugly mug. Things were already looking better. The plan fell apart, however, when my son Sam took possession of the crow call while they were walking around the store and accidentally set it down as soon as he saw something else attractive. It never made it through the checkout line. No problem, mistakes happen. I hatched a plan to run back to Runnings after dinner and buy it. “Daddy, I got the hook stuck in my shorts.” He said. He was wearing mesh basketball shorts with the tiny holes in the fabric, and one of the hooks had slipped into the hole and the barb was preventing it from sliding back out. I pulled over and worked on it for a while. It was very close to the region on a male that is very sensitive, so I worked with extreme precision to extract it from his shorts. When I started, only one treble hook was stuck. Halfway through the procedure the other treble hook was hooked as well. “Just be real still and we’ll take your shorts off when you get home. That will be much safer.” I reassured him. I meant it and really believed it to be true, especially given my history of inabilities to set hooks when fishing. But, there are firsts for everything. Upon arriving home, I slid my hand under him and gently lifted him out of the car. The Rapala, doing what Rapalas are supposed to do, grabbed everything within its reach. The bottom hook grabbed his booster seat and the other hook, still clinging to his shorts, set into his thigh. His scream told the whole story. My wife and I triaged him on the kitchen floor, making endless promises of candy, ice cream cones, toys – anything to calm him down. He had gotten one of those candy ring pops for Easter, and he’d wanted it from the time he laid eyes on it. Steph grabbed it, slipped it on his finger and held him while I iced the area around the hook. At one point I felt strangely jealous of him lying there in my wife’s lap, sucking on a ring pop while she held him tight (except for the fish hook in the upper thigh region). After cutting his shorts off around the hook I was able to see that it had slid under his skin and had come out again, the barb preventing it from being pulled back through without causing a lot of pain. Pliers did not help the situation, but my nippers out in my truck sure did. I cut the hook and the lure was finally free, which allowed the barbed half of the hook to fall out the exit hole. A little Neosporin and a Transformers Band-Aid over the hole and he was all patched up. “See, Buddy, I told you not to worry about it.” Ugh…no Dad of the year awards for me. On the other hand, earlier in the day he was having a hard time understanding the concept of a barbed hook. Now he knows, and it’s safe to say he’ll never forget. That was a long way of letting you know I never made back to Runnings to get the crow call. This was much cause for concern since I was planning to hunt an area I hadn’t been in last fall. Not only did not know if there were turkeys in the area, I had no good way of locating them in the morning. 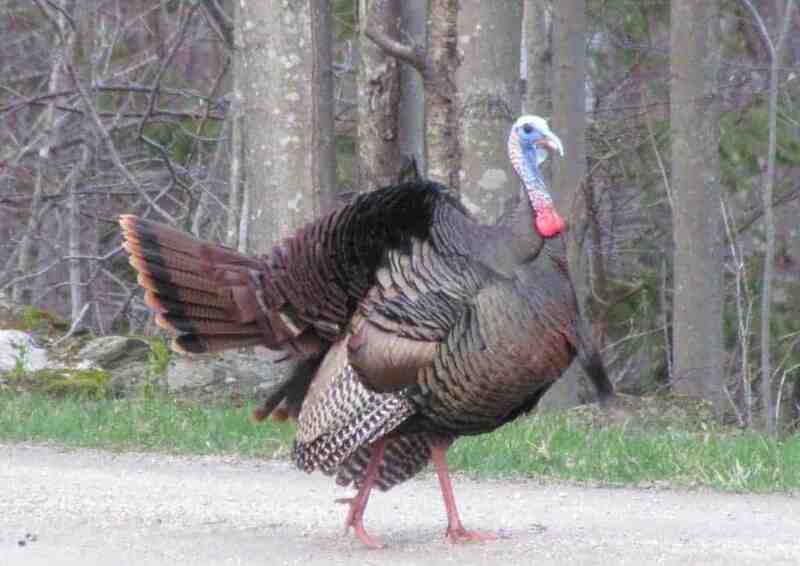 Probably the same set of challenges faced by every first time turkey hunter. I arrived early and set Shells up in the upper end of an old field with hopes that Tom might take notice at some point. As I snuggled with the ticks, two owls started hooting back and forth in the darkness – one on the same ridge line as me, the other on the opposite hillside. It was a real joy to sit there and listen to them talk to each other. They carried on for some time and then I heard it – a gobble off in the distance. I was so excited to hear it I had to relieve myself of my morning cup of coffee! My inexperience here may have cost me the bird. Tom had gobbled on the opposite hillside and about 300 yards down the valley. There was a good sized creek between us and a deep ravine. I probably should have grabbed Shells and reset closer to him, but I decided to stay put. He gobbled a fair bit while still in the tree, but got much quieter when he flew down (or so I imagine). He gobbled only a few times over the next hour and I could never get him to come in. I decided to move. I worked my way slowly toward where I’d last heard him and called every 100 yards with hopes that he would respond, alerting me to his position. Nothing. Eventually, I worked my way through the area where he had been gobbling and found some fresh scrapings but no birds. 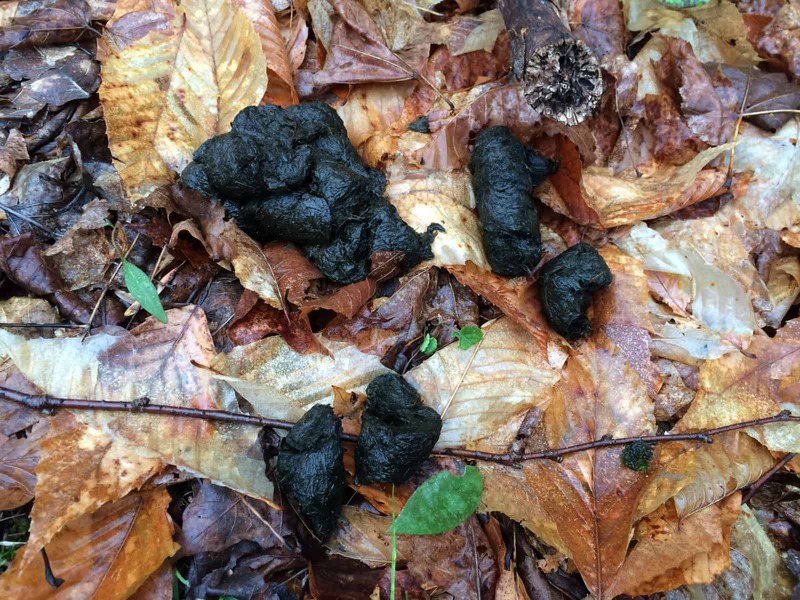 I did find a huge pile of fresh poop, though. 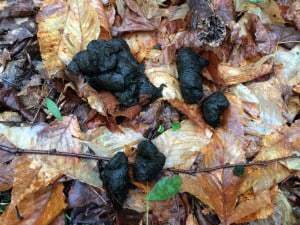 My inner detective deduced that this was bear poop, given the absence of toilet paper at the scene, and formulated a theory that Mr. Bear had cruised through the area a short while earlier, spooking Tom and any lady friends he may have had with him. I carried on and made a big loop, eventually ending up back on the same ridge I’d started on. This required me to hunt down the valley and cross back over the deep ravine and brook that originally separated Tom and me. About halfway back to my starting spot, and directly across the ravine from where I heard Tom gobbling earlier in the morning, I gave a hen call. Tom Gobbled. I called again. Tom Gobbled again! That darn bird was right back where he’d started the morning, and now we had the ravine separating us again! Tom [Eyes rolled back in his head]: WE WOULD MAKE BEAUTIFUL BABIES! I WANT YOU! And that’s how my conversation with Tom ended. Birds are weird, for sure. Though if I am totally honest with myself, I don’t think I was much different than Tom when I was trying to capture the attention of the love of my life. The only difference is that I was willing to put in the effort to cross the FREAKING RAVINE!!!! Here is my conversation with Tom. I filmed this with my phone and it’s easy to hear the gobble on that at the end of the clip. On YouTube it’s very hard to hear. Makes me wonder if I imagined the entire thing…. Well if it was easy anyone could do it. OH WAIT………..